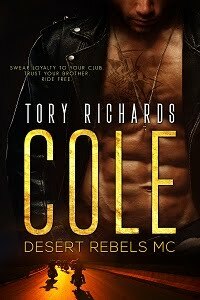 TORY RICHARDS: Never Before Posted! Excerpt of Kiss Me!, this month's book focus. The sensible part of his brain told Mike to distance himself now, before things went too far. Yet he held Emma tighter. Then it occurred to him that if he wasn’t going to turn her loose, he couldn’t very well continue to hold her without a justifiable reason. “Let’s dance,” he barked in a less than friendly tone. “You think this is funny?” he questioned gruffly, a little put out by her misplaced sense of humor. An aroused man was like an angry bear. Didn’t she know that? Course, he wasn’t making things easier by keeping her in his arms. Maybe he had made up his mind to get his kid raised and out of school before pursuing personal interests but that didn’t mean he couldn’t enjoy the foreplay, the forbidden excitement. The new excited rush of what could be. It didn’t have to lead anywhere, did it? He gave up trying to find a place to put his hands that didn’t end up on naked flesh, finally settling for the curve of Emma’s hips. She placed her hands on his shoulders naturally, drawing her body closer to his. Before Mike realized what he was doing, his hands slowly rose to her waist and above, halting beneath the swell of her breasts. It was a move he was going to pay for. He tried to halt the sudden rush rolling through his blood but it wasn’t fast enough to keep his senses from going into overdrive.